Jon Mould outsprinted Harry Tanfield to take the honours at the Skipton Grand Prix as his JLT Condor teammate Matthew Gibson went to the top of the HSBC UK | National Circuit Series standings. The second round of the series saw racing remain in Yorkshire, but this time on a sunny evening as opposed to last week’s rain-drenched event in Otley. And it was a JLT Condor affair as they took four of the top five placings in the race, with just BIKE Channel Canyon’s Harry Tanfield breaking up the party and almost getting himself the win, before coming home second. The pace was frantic at the start with the field lapping the Skipton circuit in around one minute and 20 seconds, meaning any attacks were quickly closed down. That was the case with Tom Moses’ early dig for JLT Condor as, despite being joined by a Raleigh GAC rider, the group quickly swallowed up the pair. Tanfield then went to the front himself, before Mould took a turn driving the pace as it became clear that JLT Condor were plotting an attack. It was Mould who initially launched the telling move, pushing on solo having taken the intermediate sprint prize. And just as he appeared to be slowing he was joined by teammate Moses as the pair formed a formidable duo at the head of the race. Frustrated by a slowing bunch Tanfield took it upon himself to bridge the gap to the leading two, unaware that he was falling into a trap. The BIKE Channel Canyon rider did not know he was joining two JLT Condor men at the front, and after he had made the junction and also brought Matt Gibson with him, to be outnumbered three to one, life was always going to be tough for him. But the quartet worked well together to keep the break away as counter attacks from the chasing group were few and far between. With the front four having increased their lead to almost a minute in the closing stages of the race, it was clear the winner would come from their group. As such it was local lad Moses that went for the line first, forcing Tanfield to chase and leading to a Gibson counter attack. When the odd one out reeled him in he found himself on the front, where he didn’t want to be, and allowed Mould to pick him off in the sprint and leave Gibson to roll home five seconds behind for the final spot on the podium. The night’s events leave Gibson at the top of the individual standings with 54 points, followed by 2016 series champion Sebastian Mora Vedri, of Raleigh GAC, and JLT Condor teammate Graham Briggs tied for second place on 44. 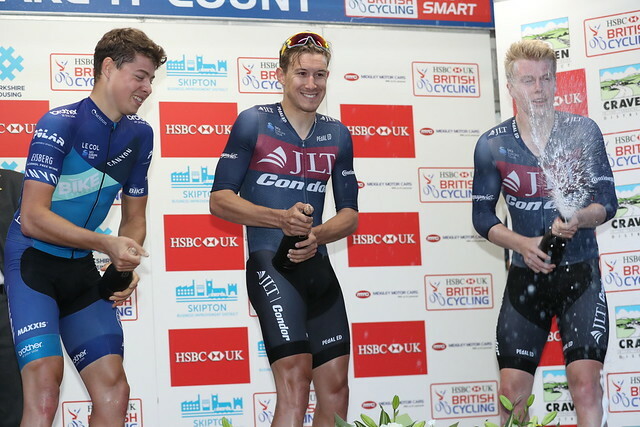 And unsurprisingly it is JLT Condor that lead the team standings on 146, with a huge 86-point lead over BIKE Channel Canyon, who sit in second on 60, four ahead of Raleigh GAC.